The deadline is this Friday, Feb. 8 for reserving space in the Cascade Bicycle Club Event & Activity Guide. 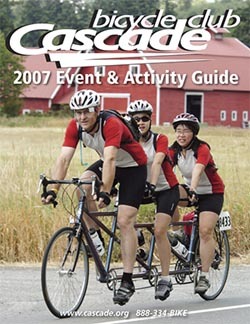 This 4-color, 55,000-copy Event Guide is printed for the Cascade Bicycle Club in Seattle, the country's largest such club with over 8,000 members. Released March 6, the Event Guide will be distributed inside all participant bags at the Seattle International Bicycle Expo (12,000 attendees!) and inserted inside 32,500 copies of the March/April edition of Outdoors NW magazine. Readers may also find it at specialty sports stores, bike shops, bicycling events throughout the summer. It will also be posted online at www.OutdoorsNW.com. To reserve your space, please contact Carolyn Price or Greg Price at Price Media, Inc. in Seattle, or click here to be directed to the page where you can download the sales flyer.